Where does the expression 101 come from? Lately I’ve been reading about Mission 101, where just a few thousand men in an Allied expeditionary force were sent into Ethiopia to defeat a far greater Italian occupation force 100 times their size. It’s mentioned in books like “Fire in the night : Wingate of Burma, Ethiopia, and Zion,” or the more obvious title of…wait for it… “Mission 101”. In late 1940 a group of five young Australian soldiers set out on a secret mission. Leading a small force of Ethiopian freedom fighters on an epic trek across the harsh African bush from the Sudan, the small incursion force entered Italian-occupied Ethiopia and began waging a guerilla war against the 250,000-strong Italian army. One of these men, Ken Burke, was Duncan McNab’s uncle. The mission wasn’t actually about five Aussies, and I’ll get to that in a minute. The name seemed strange to me, in modern context, because we use 101 to imply some kind of basic level. Someone saying “Mission 101” today sounds almost exactly opposite to the task of taking a few soldiers into unknown territory against massive odds. That sounds really hard, right? Many freshmen will kick off their college careers with courses like Psychology 101, English 101, or History 101. When did introductory classes get their special number? In the late 1920s. The Oxford English Dictionary finds the first use of “101” as an introductory course number in a 1929 University of Buffalo course catalog. Colleges and universities began to switch to a three-digit course-numbering system around this time. This is a wholly unsatisfying answer. It takes for granted that in transition to a three number system someone would only use 101, and not 100, 010, 001, 000 or any other possible combinations. I needed more. And the search engines were doing little to help, not least of all because searching for anything + “101” gives you an introduction to that topic and not the expression. Instead I dug into the details within “Fire in the Night” by John Bierman and Colin Smith. 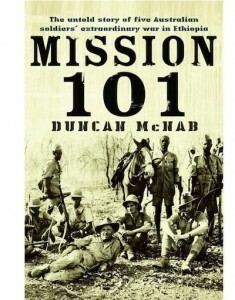 It says Mission 101 had a leader named Lt Col Dan Sandford who served as artillery during WWI, and then as British Consul to Abyssinia before retiring there at the end of his term in office. The key to this story is British artillery in WWI commonly used a fuse numbered 101 on their shells. So why would Sandford name his mission after a fuse on an explosive shell? Britain had used their presence in Sudan to train Ethiopians as guerrilla forces after 1935, due to war with Italy that year. When Italy invaded Sanford was forced to escape back to England. In October 1939, as Britain saw war with Italy fast approaching, Sanford was sent into Khartoum to gather Ethiopian exiles, round up military supplies, and trigger a popular uprising inside Ethiopia to push the Italians out. Australians don’t get a mention. There you have it. Using a small fuse to trigger or initiate a much larger explosion makes sense, given the 101 British fuse history and the leadership role of WWI veteran Sandford. The best guess comes from a war museum file (found at © IWM MUN 2582) where the term simply went from military use to more common public use in 1920s as slang or example of “starting” or “initiating”. The No 101 percussion fuze was introduced in 1916 and represented an attempt to overcome the No 100 fuze’s weak points. 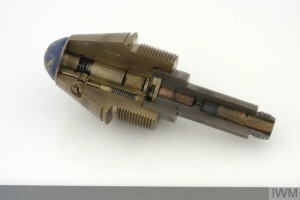 The 101 did away with the ‘cocked pellet’, used a fixed needle, and placed the detonator in the graze pellet. The needle was originally pressed in, but loose needles often caused premature explosions and a screwed-in needle was used after the Mark I. The 101 ran to five ‘Marks’ and was declared obsolete in 1921. 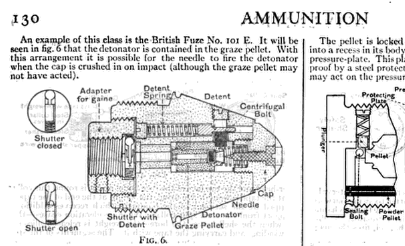 A good example of this public use and general knowledge comes from the Encyclopedia Britannica of 1922, which explained in detail on page 130, that the 101 is an example of the graze fuze for artillery shells. It even uses the phrase “this class”.